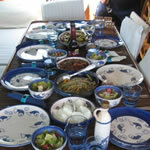 Recent Boundless Journeys guest, Mary Lil Chappell, shares her experience exploring beautiful coves and hidden villages, and indulging in delightful cuisine, on our September 2009 Turkey: Istanbul to the Turquoise Coast tour. Spent the night anchored in a cove. I slept on deck which has become my habit now. Great breakfast (as always) this morning: eggs scrambled with fresh tomatoes and cheese, both black and green olives (with every meal – and with pits), different types of cheese in wedges, toasted french bread and butter, fresh preserves (apricot, something dark and seedy, plum, and strawberry), fresh ground salt and pepper, platter of cut up fruit (peaches, their particular type of honeydew, watermelon, huge figs, and grapes), a huge pitcher of fresh squeezed orange juice (every morning), water and Turkish coffee. After breakfast, into the dingy (takes two trips for us all) and onto St. Nicholas Island where we hike up to several “churches” left from 7th century – monastaries – the cross carved above the cornerstone of one – amazing to think of the history. We’re the only ones up here it appears. Now we’re “out to sea’ so to speak, but staying pretty close to the coastline, water right up to the cliffs here, some covered with stumpy “broccoli” trees (my term) and rounded bits of smaller, scattered vegetation – other cliffs stark and jagged, their other half it appears carved off centuries (or more) ago – revealing many layers, carved off at a 60 degree angle, some with “shelves” sticking out, as if you could run a knife through the lines and lift some of the top layers off. The Mediterranean today is a little choppy out in the open, away from the placid cove. The captain says we’ll be in the Agean tomorrow. Don’t miss this incredible experience. Join us in Turkey for a cruise along the Turquoise Coast, June 13-25.